The Paris Terrorist Attacks. The Worst in France’s Recent History. What Next? An Increase in US-NATO Military Actions in Syria and Iraq? 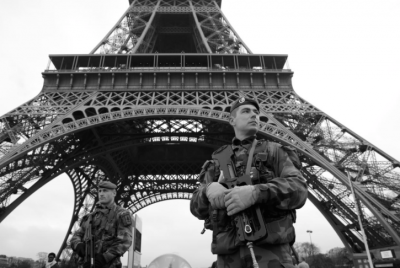 The horrific Paris terrorist attacks have been met with shock and panic. in a bitter irony politicians and the media stand united in one thing – capitalising on events. The latest terror attack was the worst in France’s history, turning 2015 into the deadliest year in terms of terror attacks on French soil with six such events killing at least 150 (129+ in the latest Paris atrocity) and injuring at least 500 overall. 2014 saw three attacks and only four attacks combined over the previous ten years. It brings back memories of the 1980’s where 35 individual terror attacks in France took place over a decade where 82 people were killed and 1023 were injured. 24 of those terror attacks were attributed to organisations with middle eastern connections such as Al-Qaeda, Hezbollah, Abu Nidal Organization (ANO) and the Lebanese Armed Revolutionary Factions or FARL. 21st August – train stabbing and attempted mass shooting. June 26th – a 35-year-old delivery driver named Yassin Salhi, a radical Islamist, decapitated his boss and attempted to carry out an apparent suicide attack on a gas factory near Lyon. April 19th -Unsuccessful attack against 2 churches in Villejuif by an Algerian jihadist. Feb 3rd – 3 military men, guarding a Jewish community center in Nice, are attacked by Moussa Coulibaly. 8th Jan – January 2015 Île-de-France attacks, a mass shooting at the satirical magazine Charlie Hebdo office in Paris. Dec 22nd 2014 – 2014 – Nantes attack. A man yelling “Allahu Akbar” ran over 10 pedestrians with his vehicle, killing one, then attempted suicide. Dec 21st 2014 – Dijon attack. A man yelling “Allahu Akbar” ran over 11 pedestrians with his vehicle. Dec 20th 2014 – Joué-lès-Tours attack. A man yelling “Allahu Akbar” attacked a police office with a knife. He was killed and 3 police officers were injured. The French have a long history in meddling in Middle Eastern regions, very particularly in Syria, Lebanon, Palestine and Iraq that came with the defeat and subsequent partitioning of the Ottoman empire nearly 100 years ago. Algeria is another sore that simmers in France – Charlie Hebdo was attacked by two men of Algerian descent – this latest one is likely to have the same involvement. With the foiled attack in August on a train from from Amsterdam to Paris, the French government decided on intervention in Syria, which it began by bombing an Islamic State training camp. This was always going to be a dangerous political strategy knowing that terror attacks at home were likely to increase. These attacks were fully expected by the French security services. As if to underline the expectation of an attack by ISIS – The Daily Express in Britain reported on September 10th that a “Syrian operative claimed more than 4,000 covert ISIS gunmen had been smuggled into western nations – hidden amongst innocent refugees. The ISIS smuggler, who is in his thirties, revealed the ongoing clandestine operation is a complete success. What can we expect now. First, the condemnations from political leaders involved in the fight in Iraq and Syria against ISIS. Newly elected Canadian Prime Minister Justin Trudeau conveyed his nation’s unwavering support, referring to France as Canada’s “French cousin” and pledging “all possible assistance.” (Having just been voted in to pull out Canadian forces). Iranian President Hassan Rouhani “Those terrorist groups that committed the Paris crimes do not believe in ethical principles and they are not loyal to any type of divine religions — including Islam,” (The Iranian leader has since cancelled a previously planned trip to France). China’s president, Xi Jinping, spoke of “these tragic times for the French people” and condemned “in the strongest ways this barbarous act”. Second, we will see a heavy increase in battle activity in Iraq and Syria as the world continues to get dragged in what many commentators feel is turning into the beginnings of a global conflict as world super-powers claim different sides. Third, Increased Internet surveillance and tighter border checks are inevitable. “They are “urgently” needed to foil jihadist attacks of the sort that rocked Paris this week, European, US and Canadian security ministers” reported BusinessInsider within 24 hours of the attacks. Fourth, the popularity of Marine Le Pen‘s right wing National Front party will rise as a result of the security concerns. Hollande will now see a fall in popularity for having failed to secure Paris. There are now 57 ‘nationalist’ political parties that have emerged in Europe over the last few years holding 867 political seats of power much to the alarm of unelected European bureaucrats. Paris now tops the list as the most dangerous city in the West and unbelievably sits at No 21 – right next to the top 20 most dangerous cities in the world that is populated largely by Iraq and Afghanistan. What is surprising is the impressive speed with which evidence such as passports is found, instant arrests made, accusations made and policy decisions executed, which stands in stark contrast to the apparent impotence of the police and security forces to interrupt them in the weeks and months before they happened. It appears “world leaders” have learned nothing from the conflicts of Afghanistan, Iraq and Libya turning them into failed states that in the end creates even more fearless hydra-like evils such as ISIS whose raisons d’être is ever more terrifying ways of killing. Having created refugees out of millions of desperate people – what were politicians expecting?